How do you become a ‘Grown-Up’ Gamer? Hello internet, it’s been a while. Ten months since my last blog in fact. There have been many reasons for the long pause: my marriage last August; the extensive renovations on our new home; the workload that comes with being a teacher, and other very grown-up things. For a few months I wasn’t even really playing video games, never mind blogging about them. The way I game has changed gradually over time, but it’s only this year that I have truly embraced the fact that the way I play needs to be altered. Maybe you’ve been through a similar experience? Perhaps you have yet to feel a change. I’ve found a few ways to adapt gaming to suit my adult life. When I was younger, if two decent games were the same price as the game I really wanted to play, I would go for the two games. It would pass the time until the newer game dropped in price, and the older games often turned out to be better than expected. Besides, I’d get through all the games I wanted to play eventually. There’s lots of things I enjoy about over-analysing Skyrim, and the responses I get are a big part of that. There are a pleasingly small number of people that misread the title and my intentions (“Oh sure, the game with dragons is veeery accurate…”), and a fantastic number of readers willing to add their own knowledge and join the discussion. Sometimes, one of you lovely people will step in and flesh out something I have mentioned or correct a minor mistake, which is awesome to see. Learning should be a two-way exercise after all. And there’s still a lot of untapped History within The Elder Scrolls. When I first asked the above question, I didn’t think I’d be able to write a third part. I was so sure that as I trundled further into the fantasy landscape, less historic details would present themselves. As magic and mythical beasts become increasingly prevalent, I expected to spot fewer references to the real ancient world. 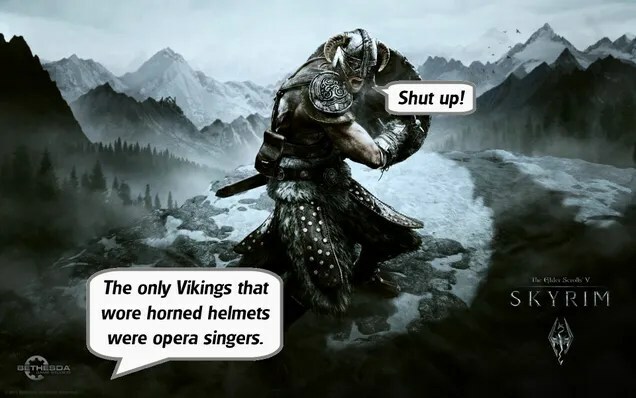 Whilst this is very definitely the case, Skyrim is still presenting quirky little historical accuracies. For those who’ve missed the first two parts, the aim here is to highlight all the little ways thatSkyrim is influenced by History. In some cases these comments refer to very real events, whilst in other cases I refer to things that people believed were real throughout History, such as dragons. 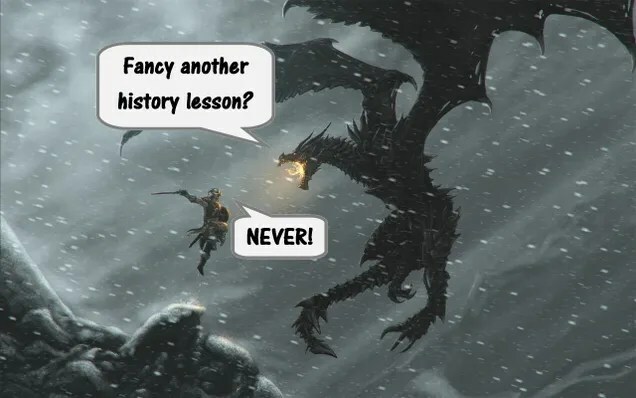 And no, I’ve still not found any historic evidence to prove that dragons were real. I’ll keep looking though. So here are a few more aspects of Skyrim that show the mighty influence of historic events. Educational Warning: Minor amounts of learning ahead. You know, the more I play Skyrim, the more I begin to realise that historical accuracy isn’t the main point of the game… and I’d be very disappointed if I wasn’t too busy Fus-Ro-Dahing the local wildlife across the landscape. A few weeks ago I began to play Elder Scrolls V, and almost immediately began to spot the many ways that History has influenced the game. The Vikings are the main inspiration, whilst other ideas are taken from various points in the middle ages. Three weeks ago I shared these observations. Some parts of the game show accurate references to historic details, whilst other features were based on misunderstandings of the past. The majority of readers seemed to enjoy the makeshift history lesson, so here we are at Part 2. 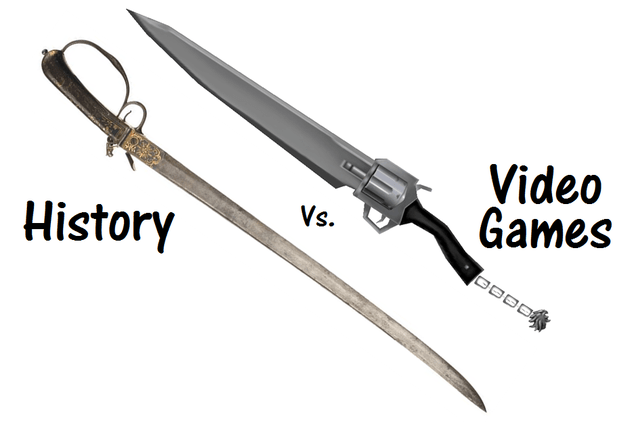 Whilst I would never consider myself a violent man, I find weapons fascinating. Whether they are a work of fiction or non-fiction, I see them as curious inventions that say a great deal about our species. Our History is full of strange and striking creations of war. It’s when Fantasy and Reality collide that things get really interesting. 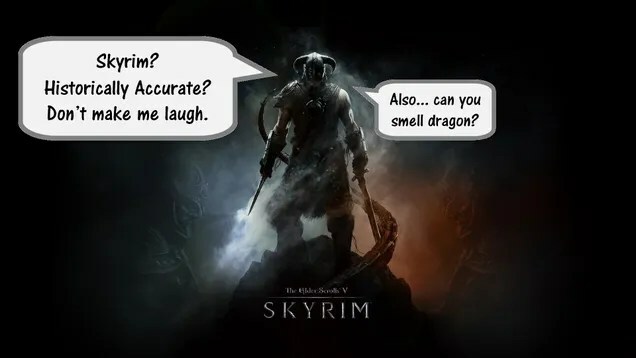 How Historically Accurate is Skyrim?